as a Breast Form Fitter. 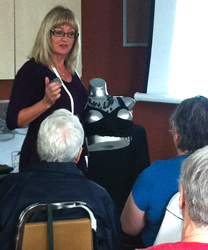 I have made it a journey to learn about breast health, and proper bra fitting and how those two go hand in hand. my products are available in over 200 sizes! as well as a large selection of Post Mastectomy." All of my products are the best for function, comfort and practicality as they promote a healthy breast, my bras are ideal for everyday wearing and are also sport worthy and that is why I am your BRA LADY, Londons 1 and only Bra Lady, Jane Collins. My bras are for all the needs of everyday women who understand and value health, comfort, and shaping. After my own 14 year personal search for a better fitting quality bra, I found a custom fit bra…..it completely changed my life! I had a “difficult” shape to fit, and despaired of ever finding anything in my size... At the time, I had over 20 bras in my drawer, all of them expensive, and none of them came close to fitting, and they were uncomfortable! 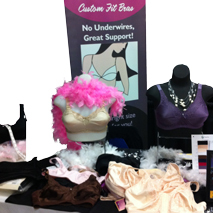 I realized I wasn't alone with having difficulties, as I shared what I had found with my custom fit bra with other women the desire to help them took me on the path to becoming "The Bra Lady" - My extensive training, in Canada and the U.S. to becoming a certified professional bra fitter and Breast Form Fitter was my journey to learn about breast health, and proper bra fitting and how those two go hand in hand in becoming The Bra Lady! Your Bra Lady! In The Community Page has all the details on my next clinics. "Meeting Jane was probably the most uplifting experience of my life and it all happened at church Yeah "God"